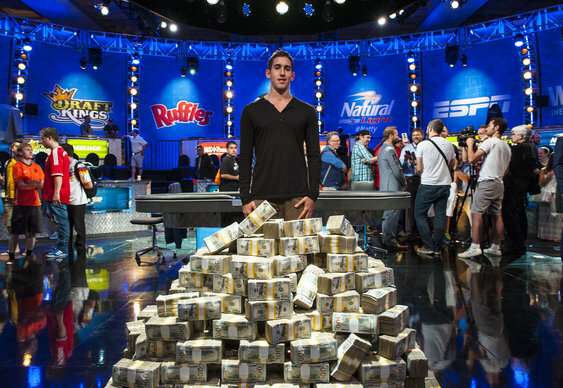 Winning $15 million in cash should be a joyous occasion for anyone on the planet; anyone that is except Daniel Colman. After defeating Daniel Negreanu heads-up to claim this year’s Big One For One Drop title, the American pro became infamous for his negative reaction to the media. Despite capturing one of the game's biggest titles and a $15 million bankroll, Colman made a hasty exit from the Rio and claimed that he was not particularly interested in promoting the game. A video clip of the pro's initial reaction to winning has now gone viral after the finale of the $1 million buy-in event was aired on US television network ESPN earlier this week. Standing across from Negreanu and needing a ten to make a straight, Colman almost looked annoyed with having to endure the theatrics of poker's biggest stage. Such was Colman’s reaction to winning one of the largest poker prizes of all-time that the clip has topped 200,000 views on YouTube within just hours of being released.